So a few years ago I was experimenting with Darkplaces and I stumbled upon a console command that made the flat textures look 3D (in that as you walked around the texture, it would change shape and look all 3d and stuff, like the rocks looked like they were sticking out of the ground). I later learned that this effect is called parallax occlusion and it does work with the HD textures I'm using because not only they come with normal/bump maps included but I also got it to work with these same textures back in the day. So here's my problem, My old PC couldn't handle this hectic effect so I had to disable it, and then I forgot about it for years. Today I have a new powerful PC (GTX 1080, Ryzen 5 2600X, 32GB RAM) and I only now just recently remembered this cool effect that I want to enable BUT I cannot remember what the command is and I simply cannot find it in the list of Darkplaces commands. I first thought it was "r_glsl_offsetmapping" and "r_glsl_offsetmapping_reliefmapping" but no. When I enable it, it really does nothing other than mess up the character and gun models a bit. Can anyone help? Could this be an issue with newer versions of darkplaces? The type of PC I'm using? (I doubt it). First of all, by reading your post and the issues that you have, you seem to be using Rygels texture pack. That was released around 2007. Unfortunately this pack has issues and bugs. One of them leads to your described behaviour: messed up gun models. The reason for this particular issue is because Rygel had alpha channels in his normal textures. My advice is to start with a new Quake folder and use the updated/new textures from the QRP team. Those guys are the ones behind Rygels texture set anyhow. What you should use is a newer DarkPlaces build as well. It has lots of bugfixes and supports new features/maps etc. Create a folder called "Quake". Inside this folder create a subfolder called "id1". That is it. Now extract the DarkPlaces build into the Quake folder directly. And copy your pak0.pak and pak1.pak into the id1 folder. 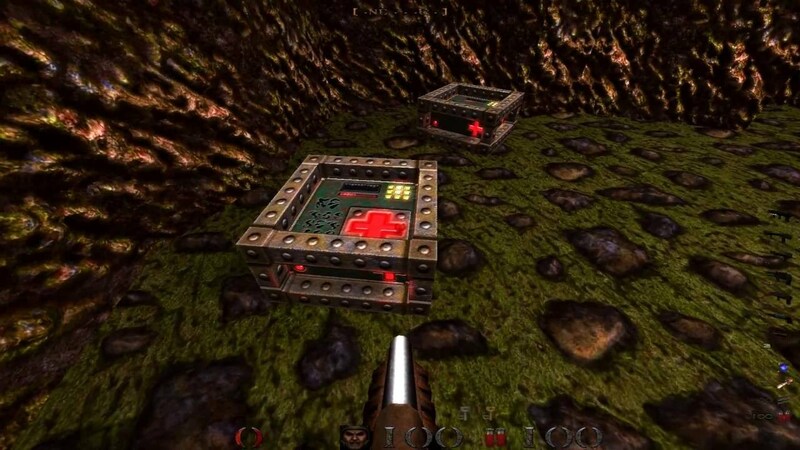 Now you can already play Quake. While you are there you should also download QRPs item textures. Extract the 7zip files so that you have the .pk3 files. Put the .pk3´s into your id1 folder. Now you have all the newest/updated game textures in high resolution and ready to use offsetmapping. but lets first concentrate on your offsetmapping issue. Now start your Quake via the darkplaces.exe file. Setup your resolution and key bindings, etc. Once everything is set you can go into console and enable the offsetmapping features. There is unfortunately no ingame-option menu point for this. You should see the difference directly. Instead of showing screenshots I link an old video clip I once made to see the effect. I hope you could solve your issue. If you have further questions, fell free to ask.